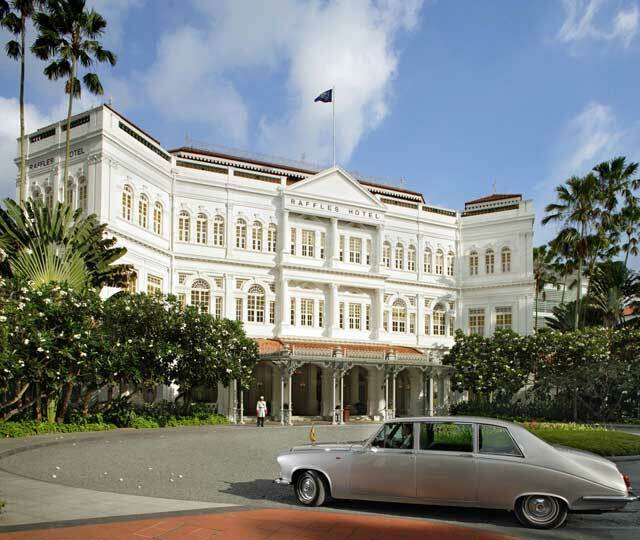 In this article we are going to have a look the iconic Raffles Hotel in Singapore. 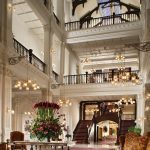 This colonial hotel is one of the worlds most renowned and famous, setting the bar for standard and service in many cases. This is where bartender Ngiam Tong Boon invented the classic Singapore Sling about 100 years ago. The guest list is full of famous people, the hotel has hosted guests like Joseph Conrad, Rudyard Kipling, Somerset Maugham, Charlie Chaplin, Noël Coward, Ava Gardner, Queen Elizabeth, Bill Clinton, Elizabeth Taylor, Sting, Michael Bolton, Kofi Annan, Isabella Rossellini and royal couple William and Kate are a few world celebrities who has frequented Raffles Hotel. 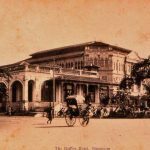 The first version of Raffles Hotel was opened in 1887 by 2 Armenian brothers, Martin and Tigran Sarkies, with only 10 bungalow style rooms. During the years buildings has been torn down and added to the structure and today it offers 103 beautiful suites. Back then it was overlooking the beach but the reclamation of land in Singapore has made the location quite distant from the water today. During the Great Depression in the 1930:s Raffles Hotel was hit hard but the financial hardship was resolved in 1933 after 2 years of receivership. During World War 2 the Japanese called the hotel Syonan Ryokan where Syonan means “light of the south” which was the Japanese name for Singapore and a ryokan is a classic Japanese inn. During the 80:s the Raffles hotel was in different stages of decay and was declared a National Monument by the government in 1987. It closed in 1989 and re-opened in 1991 fully restored into the same style and shape it had in 1915. This is what Raffles Hotel in Singapore looked like in the beginning. 84 regular suites (Palm Court, Courtyard Suites), 12 Personality Suites, 5 Grand Hotel Suites and 2 Presidential Suites make up the 103 suites in total. All suites have separate sleeping and living quarters. The Courtyard, Palm Court and Personality Suites are similar in its layout and design where the Palm Court Suites are overlooking the garden with rattan furniture just outside the door. The Personality Suites are named after famous guest who have stayed in them and usually Courtyard Suites. I have been fortunate enough to stay at The Raffles Hotel twice and have been extremely satisfied and pleased both visits. There is nothing missing in the rooms and your butler is at your service to take care of almost any wish you might have. I would like to say that checking into Raffles is like checking into the last century with all the modern amenities! Personally, I think you should go for a Courtyard Suite overlooking the lawn and the palm trees. The price difference from the entry level rooms is negligible but the experience so much better. 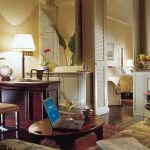 The bedroom in a Courtyard Suite at Raffles Hotel, Singapore. The parlor of a Courtyard Suite at Raffles Hotel, Singapore. 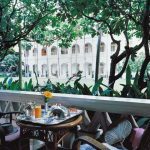 The verandah of a Raffles Courtyard Suite, Singapore. I could walk around the hotel for hours, just looking at the memorabilia from past times and indulging the colonial atmosphere. There are several historic items, both from east and west, in the interior of the hotel and like walking around in an antique store. One amazing fact about the hotel is that there is more than 700 oriental carpets. 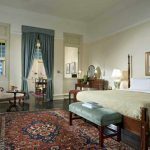 In the living room of the Sarkies Suite is a large carpet remarkable for its subdued, elegant colours and beautiful patina. It was hand-woven in the studio of gifted carpet master, Saber, between 1930 and 1935. This six by four metres carpet is one of the most precious in the hotel. In 2009, it returned to the hotel after an 18 months period of meticulous restoration in its birthplace in Mashhad, Iran. 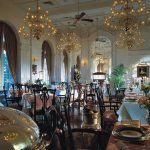 Yes, it sounds boring to eat at the hotel but the restaurants at Raffles Hotel is much more than a hotel restaurant, they are destinations in themselves and well worth a visit even if you are not staying here. Breakfast is usually served in The Tiffin Room and at first I was a little worried because the buffet looked small for being at a 5-star hotel. Seconds later I realized that it was only the cold part of breakfast on the buffet, the rest is cooked á la minute! When not serving breakfast to residents of the hotel the room is used for the classic Afternoon Tea and their famous curry buffet. 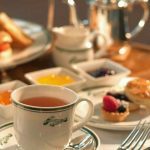 The Afternoon Tea is an experience in itself, very popular and reservations recommended. It does what it says on the label, good steak in a nice atmosphere. This is where the famous Singapore Sling was invented and probably one of the most famous bars in Singapore and a “must” for first time visitors to the city. Singapore is known to be squeaky clean and this is probably the only place where you are allowed throw your peanut shells on the floor without feeling guilty or being punished. Behind the reception in the lobby and a nice place to relax with a nice drink and some soft piano music in the background. 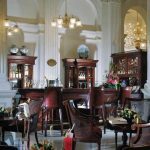 A perfect place for an aperitif or coffee after your meal, if you are planning to eat in the Tiffin Room or at Raffles Grill. Raffles Grill at Raffles Hotel in Singapore. Afternoon Tea at Raffles Hotel, Singapore. Writers Bar at Raffles Hotel in Singapore. This is where a tiger was shoot under the billiard table according to the legend, but all facts available says that is was shot underneath the bar and billiard room, which were then on stilts. It happened early in the last century, and accounts differed when I stayed there. This is where you will find the Martini Bar with over 50 different Martinis to try and a lavish European buffet served Thursday – Saturday for lunch and dinner. I have not been fortunate enough to try the Raffles Grill, Ah Teng´s Bakery and Raffles Courtyard but I see no reason for them to perform any less. I have had customers celebrating an anniversary at the Raffles Grill who were very satisfied. Budget minded travellers constantly debate if a stay at a luxury hotel is warranted or not. No matter if you have an unlimited budget or if this is a stay that takes an extra effort to happen, Raffles in Singapore is definitely worth it. It is an experience like no other and a walk through history. Service and focus on making the guests stay comfortable and memorable is a priority amongst the staff and I could not have wished for anything to be different. If you want to learn more about exciting Singapore, you want to check out my articles: An Introduction to Singapore – The Capiral of Asia and 5 Things To Do Off the Beaten Track in Singapore. For more information about the hotel, please check their website: raffles.com/singapore. If you enjoyed this article, you might enjoy my other articles about hotels. If you are looking for a similar hotel in Italy, I think you will like Villa Cora in Florence. Update 2017-08-09: Raffles will close completely for renovation at the end of 2017 and re-open in the later part of 2018. If you are interested in the hotel´s history and stories from the hotel, I can recommend “One last look at Singapore´s Raffles Hotel” on channelnewsasia.com. I hope you enjoyed this review of Raffles Hotel in Singapore. Please share your experiences, tips, thoughts and comments on Twitter, on Facebook or in the comments below. I am looking forward to hear from you!